America: On the Brink of Civil War? Special Report: America: On the Brink of Civil War? Every time I see a news story that I find troubling... I bookmark it. I either write about it eventually, or it becomes a permanent piece of my evidence folder — evidence of the injustices going on all around us. Taken individually, these stories are each a part of the bigger overall picture. And sadly, that pictures is growing increasingly bleak. One report I found, exposes America as an oligarchy, with its foreign and domestic agendas dominated by the interests of a wealthy elite. Another shows the full extent of the government's surveillance program. It demonstrates the far-reaching capabilities of U.S. intelligence agencies (the FBI, NSA, CIA, etc.) and their unchecked power. Still another shows just how militarized America's police have become. Dressed in full-body armor, they patrol cities and suburbs in mine resistant armor-plated vehicles (MRAPs). They use drones to catch speeding cars, property violations and even, cow theft, if you can believe it. Then, most disturbing of all, we see the death. Mass shootings. Terrorist attacks. Unarmed civilians shot dead by police officers. Retaliatory attacks against cops. Everywhere you look, Americans are dying in the streets. And the ones that are surviving? Well, their quality of life is quickly deteriorating. Salaries and wages are going down. Prices are going up. The middle class is shrinking. Soon, there will be only a small wealthy group of asset owners – those that own business, land, and stocks – and one great big group of working poor. That's the direction this country is headed. That's why every election of the past 20 years has been about “disenfranchised groups” – from former factory workers to minorities. It's why politicians are constantly promising change, even as things continually stay the same. And it's why “radical” and “fringe” politicians like Donald Trump and Bernie Sanders have suddenly found so much success. Ladies and gentlemen, our country is on the brink. I'm talking about another civil war, another revolution. I don't know which sides will emerge. They could be divided by class, race, or both. It could simply come down to The People vs. The Power. But it's coming. All you have to do is step back and put the pieces together like a giant puzzle. But that wealth is unevenly distributed, and nowhere is that more evident than in the U.S., which also has the largest wealth inequality gap of 55 countries studied, according to the report. The report found that America’s wealth inequality is even more gaping its income inequality. In fact, the report dubbed the U.S. the “Unequal States of America” due to the size of the gap. It's no secret that America is unequal. But the scale of that inequality and the political implications are breathtaking. You see, I have no problem with people making money, or generating huge sums of wealth. To the contrary I want to help them do just that. The issue here, though, is how that mone is being spent. The problem is that the rich and powerful buy lobbyists, politicians, and even whole elections. The US is dominated by a rich and powerful elite. So concludes a recent study by Princeton University Prof Martin Gilens and Northwestern University Prof Benjamin I Page. This is not news, you say. "Multivariate analysis indicates that economic elites and organised groups representing business interests have substantial independent impacts on US government policy, while average citizens and mass-based interest groups have little or no independent influence." In English: the wealthy few move policy, while the average American has little power. As usual, the academic report proves years after the fact what many citizens have already come to know: their vote doesn't matter. This is the sentiment that runs down the spine of movements like Occupy Wall Street and the Tea Party. Neither group wants to admit they have much in common, but they're both rebelling for the same reason: The death of democracy. After 14 years at National Public Radio, Andrea Seabrook left in July and, to hear her talk about her experience covering Capitol Hill, it's clear that she had one takeaway: It's damn frustrating. "I realized that there is a part of covering Congress, if you're doing daily coverage, that is actually sort of colluding with the politicians themselves because so much of what I was doing was actually recording and playing what they say or repeating what they say," Seabrook told Politico. "And I feel like the real story of Congress right now is very much removed from any of that, from the sort of theater of the policy debate in Congress, and it has become such a complete theater that none of it is real. [...] I feel like I am, as a reporter in the Capitol, lied to every day, all day. There is so little genuine discussion going on with the reporters. [...] To me, as a reporter, everything is spin." Hear that? You're being lied to. We all are. The government does not have your best interest at heart. It cares only for the interest of those with money and power - politicians and billionaires. The commoners are being suppressed. "As technology advances, so does the government's surveillance powers. If we want to protect our privacy rights, the exercise of this power has to be subject to limits," writes ACLU deputy legal director Jameel Jaffer in the New York Times "Room for Debate" discussion about the use of drones domestically, and whether they pose a threat to privacy. Why would the government need to see who's at what political rally? These events have set the stage for a new Civil War-type showdown in the United States. Yet that's the consensus of many of America's mainstream politicians. March 26, 2013: Bloomberg Wants to Infringe On Your Freedom. Liberty In Decline: New York City Mayor Michael Bloomberg said that he thinks "there are certain times we should infringe on your freedom." If he really believes that, then he truly is a little tyrant. Bloomberg's attitude is dangerous — and ubiquitous. Elected officials all across this land of the free feel the same as he does, though they rarely express it as vocally as he has. But it's there, from proposals to carve up the Second Amendment to confiscatory tax rates and the accompanying redistribution of wealth, and from ObamaCare's individual mandate to Bloomberg's court-reversed ban on large soft drinks. If the state can infringe on freedom at "certain times," then it can do it at any time. Once that wall has been breached, it's only a matter of how far government goes. And as we've seen, and as Thomas Jefferson foresaw, the trend has been for government to grow and liberty to yield. That wall has been breached and it only gets bigger as the invaders drive deeper into occupied territory. The Pentagon says it's given about $40 billion to police departments to buy military-grade equipment since 9/11. And they're putting that equipment to use. Whether it's something petty, like Bloomberg's decision to rule what size drink you can buy (since struck down), to something more blatantly unconstitutional, like his program of racially profiling and searching without cause New York City's youth (since struck down). Don't like their tyrannical practices? You might end up with a smashed orbital bone like 44-year-old Christina West of Tallahassee, Florida. As the use of deadly force by police once again roils the nation, the number of fatal shootings by officers increased from 465 in the first six months of last year to 491 for the same period this year, according to an ongoing two-year study by The Washington Post. This year has also seen more officers shot and killed in the line of duty and more officers prosecuted for questionable shootings. A Post database that tracks fatal shootings by police shows a 6% increase in the number of such deaths during the first six months of 2016, compared with the same period last year. Fatal encounters are strikingly similar to last year’s shootings: Blacks continued to be shot at 2.5 times the rate of whites. About half of those killed were white, and about half were minorities. One-quarter were mentally ill. The poor and the disenfranchised, these are the people that feel the full force of the state on a daily basis. Is it any wonder why there's so much resentment? Right here in Baltimore, where I live and work, Freddie Gray was killed by the police who apprehended him. He committed no crime and his death was ruled a homicide by the medical examiner. Was anyone held responsible? No. No one even lost a job - not even demoted. Except, of course, the taxpayer. That's because the city of Baltimore paid out $6.4 million to settle civil claims to Freddie Gray's family. 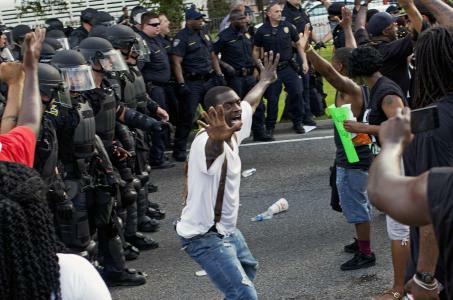 And then there was the $20 million cost of the riots that sprouted from this injustice and devastated the city. Not only are innocent citizens are being killed by the police state, they're paying for the privilege. And all the while, the upper-class goes unchecked, safely ensconced above the law. Of all the topics on which I've focused, I've likely written most about America's two-tiered justice system — the way in which political and financial elites now enjoy virtually full-scale legal immunity for even the most egregious lawbreaking, while ordinary Americans, especially the poor and racial and ethnic minorities, are subjected to exactly the opposite treatment: the world's largest prison state and most merciless justice system. The New York Times this morning has a long article so perfectly illustrating what I mean by "two-tiered justice system" — and the way in which it obliterates the core covenant of the American Founding: equality before the law — that it's impossible for me not to highlight it. The article's headline tells most of the story: "In Financial Crisis, No Prosecutions of Top Figures." It asks: "why, in the aftermath of a financial mess that generated hundreds of billions in losses, have no high-profile participants in the disaster been prosecuted?" And it recounts that not only have no high-level culprits been indicted (or even subjected to meaningful criminal investigations), but few have suffered any financial repercussions in the form of civil enforcements or other lawsuits. The evidence of rampant criminality that led to the 2008 financial crisis is overwhelming, but perhaps the clearest and most compelling such evidence comes from long-time Wall-Street-servant Alan Greenspan; even he was forced to acknowledge that much of the precipitating conduct was "certainly illegal and clearly criminal" and that "a lot of that stuff was just plain fraud." Despite that clarity and abundance of the evidence proving pervasive criminality, it's entirely unsurprising that there have been no real criminal investigations or prosecutions. That's because the overarching "principle" of our justice system is that criminal prosecutions are only for ordinary rabble, not for those who are most politically and financially empowered. We have thus created precisely the two-tiered justice system against which the Founders most stridently warned and which contemporary legal scholars all agree is the hallmark of a lawless political culture. This stuff is the epitome of anti-liberty and anti-individualism. Quite frankly, it's anti-American. And when will things start to change? I'd say now... and they're starting to. America's on the brink. It's been palpable for a few years now. And the evidence keeps mounting that the country is undergoing a long period of volatility and change. This is not hyperbole. I've already outlined for you the theory of generational turnings, and how we're currently in a Crisis that will eventually morph into a High. Several sheriffs' departments across the country have flat-out said they won't enforce any efforts to infringe on the Second Amendment. The entire Federal Government has been shut down because of ideology. This is an era in which institutional life is destroyed and rebuilt in response to a perceived threat to the nation’s survival. Civic authority revives, cultural expression redirects towards community purpose, and people begin to locate themselves as members of a larger group. Fourth Turnings have all been new “founding moments” in America’s history, moments that redefined the national identity. The signs of real change are everywhere. All of this has been about "those in power" maintaining the status quo — and keeping your freedom and prosperity in their tight little grip. In 2001, the gross domestic product (GDP) of the United States accounted for 31.8% of all global economic activity. Today, it's only 22%. In 1988, the Economist determined the United States was the No. 1 place to be born. Today, the U.S. is tied for 16th! The U.S. government borrows more than half of every dollar it spends. Over 46 million Americans are on food stamps — and one out of four are children. Nearly HALF of all Americans live in a home that receives direct benefits from the federal government. The value of the U.S. dollar has declined 96% since the Federal Reserve was created. One in four U.S. workers makes less than $10.00 per hour. The suicide rate in the U.S. has more than doubled since 2000 — and there are twice as many suicides as homicides. More than 33% of American are obese. The use of antidepressants has increased 400% in the last two decades alone! But even though it all looks pretty bleak, I've got some good news: America's long winter is about to end — taking with it the endless days of crisis and discontent. It will end the reign of crooked Wall Street Bankers, fat-cat CEOs, and their cronies at the ratings agencies who flooded the market with worthless subprime loans. It will end Washington's spending spree and run-up in the national debt to the highest level in U.S. history, now over $17 trillion. It will end the National Security Agency's domestic spying programs that have been recording all your email, Internet activity, and telephone calls for years. It will end the IRS targeting of political groups and individual citizens that disagree with them. It will end FBI intimidation of news agencies through the confiscation of phone records and labeling of journalists as "criminals," when they are, in fact, doing their jobs by exposing government corruption. In light of all that we've been through, it's easy to see there is something very wrong with America. But the good news is that one season ALWAYS turns to the next. And this "American Winter" is ushering in an "American Spring" that will send our country soaring to new heights — heights not seen for more than 80 years. It will change the trajectory of the nation and present myriad investment opportunities to alert investors. So make sure to stay on top of each Outsider Club issue to stay informed on these events and opportunities as they play out.